Tanzanian model and video vixen Hamisa Mobetto has reacted to claims that her baby daddy bongo flava star Diamond Platnumz has stopped paying child support for their son Dylan. Rumours have been rife in the Tanzania showbiz scene that Diamond has stopped supporting Dylan altogether following the deterioration of his relationship with Hamisa. It has been reported that the one-time lovebirds are currently not seeing eye to eye. The two broke up last August when Diamond claimed that Hamisa had been using witchcraft to lure him into marriage. But even then Diamond continued to provide for his son until recently when he completely cut the support, this according to media reports. The situation is said to have left Hamisa, a mother of two, devastated since she doesn't get along with the rest of Diamond's family, especially the singer's mother, Sandra. When reached for comment by Global Publishers, a rather irritated Hamisa blasted the publication saying it is none of anyone's business to know if Diamond has stopped supporting his child or not. "Nyie nanyi mnachosha, sasa kama ameacha kutoa huduma kwa Dylan inawahusu nini? Niacheni bwana, maisha yangu na familia haiwahusu. Mnauliza ili iweje (So what if he has stopped paying child support? Just mind your own business and stop meddling in my family issues)," Hamisa said. 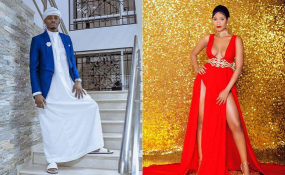 Diamond sired the boy with Hamisa, when he cheated on her ex-partner, South African-based Uganda socialite Zari Hassan with whom they have two children. In February 2017, Hamisa, who also has another daughter from a previous relationship, had her child support case against Diamond thrown out by the court. Hamisa had sued the singer for child negligence and was demanding a monthly upkeep of Sh230,000. The case was however thrown out of court on a technicality.